Minister for Horticulture, Law, Justice & Parliamentary Affairs Syed Basharat Ahmed Bukhari today said this during a meeting with senior officers of the Horticulture Department convened to review and evaluate proposals for the development of sector in the state. 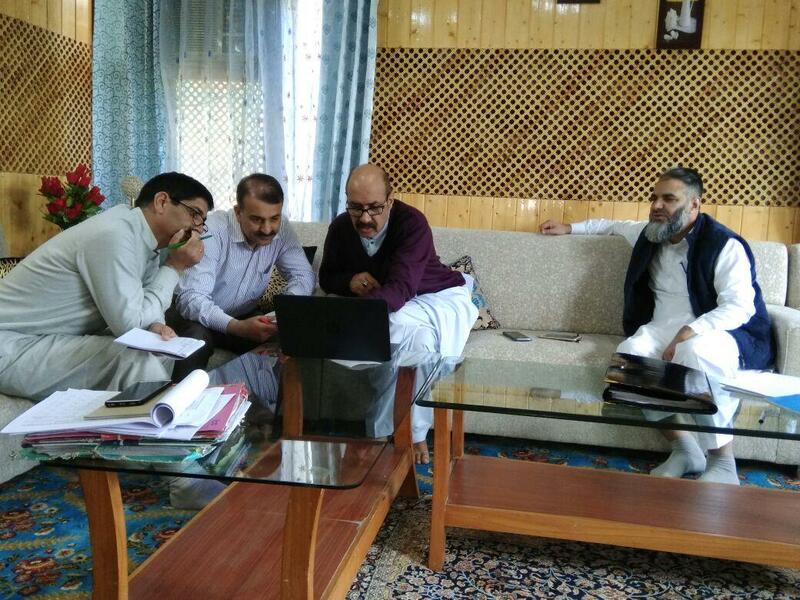 Secretary Horticulture Manzoor Ahmad Lone, Director Horticulture Kashmir Manzoor Ahmad Qadri, besides senior officers of department were present in the meeting. The meeting discussed various pertinent proposals to further increase the reach and ambit of the growers’ facilitation efforts of the department. During the meeting, it was decided that Skill Development Institutes will be established in the state that will equip fruit growers with necessary technical skills like pruning, grafting among others, so as to increase the quality of state’s produce. 'These institutions will not only facilitate growers by developing their technical skill set for increased fruit production but also provide certificate courses. With these Institutes we aim to achieve two front objective of improved quality in state's fruit yield and employment opportunity generation for people'', the Minister asserted. As part of department’s initiative to facilitate growers in marketing, it was decided to constitute one Farmer Producer Organization (FPO) /Farmers Interests Group (FIG) in each of the 197 horticulture zones in the state. “To begin with, one shall be constituted in each of the demarcated 197 zones which will be increased in future according to the response received. These will enhance marketing facilitation to growers so that their produce can fetch higher values thereby increasing grower returns on yield besides increasing transparency in the trade”, Bukhari said. During the meeting it was also decided to establish six spots in the state as horti-tourism spots. These spots- 3 in Kashmir, 2 in Jammu and one in Ladakh will carry indigenous fruit varieties of the division to provide visitors an immersive educative experience familiarizing them with the rich bio-diversity of the region besides preservation of the local indigenous varieties of the state. The Minister said “these spots will also act as one spot gene pool for preservation of horticulture diversity available in the state. They will also facilitate the process of preserving the plasma of these varieties in the National Gene Bank”. It was decided that for this purpose CHO Samba and CHO Srinagar have been appointed as nodal officers responsible for establishment, development of these spots. The nodal officers will be working in consultation and close coordination with SKUAST to achieve the objective. The meeting also took review of proposals under Mission for Integrated Development of Horticulture (MIDH).